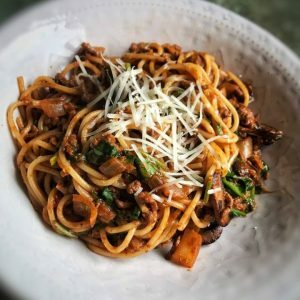 The hubbie and I do love a quick and easy spaghetti bolognaise and we are always looking at ways to change it up and make it more exciting. That’s why, after trying and loving my new spice paste, I thought it might be a nice addition to this dish and I have to say, not only is it a nice addition, I’m not sure we will make a bolognaise without it again! The addition of a few new ingredients really does take the bolognaise to a whole new level and funnily enough, after it has simmered, it doesn’t actually taste too strongly of the paste. Instead the result is the most delicious meaty/beefy and yet tangy dish which tastes so incredibly indulgent, all for a bargain of 5sp per potion. I’ve made this a few times and served it with either 50g of normal spaghetti or butternut squash noodles or even 50g of whole grain rice (remember to add the points for the ride or pasta). All have been delicious. I urge you to give this one a go very soon!! You can buy Korean chilli paste from most Asian supermarkets or you can buy it online (I bought mine from souschef.co.uk) or in Waitrose and Ocado. It has the most amazing flavour; a little savoury, a little sweet but nice and spicy. Brown mushrooms in a single layer. Don’t season or shake as this will release water and they will go gooey. If you leave them they will go lovely and brown and nutty. Do in batches then remove from the pan and pop to one side. In large sauce pan, add the mince and onion, season and brown for 7-8 minutes until cooked through. Add the garlic, peppers and chilli and fry for another few minutes and then add the chilli paste and tomato puree. Stir, simmer for a minute and then add the soy and beef stock with the mushrooms. Bring to a boil then reduce to a simmer. Simmer for 15 minutes. Once reduced and the mixture is not as wet, add the parmesan and spinach, stir and simmer until the spinach has wilted. Season to taste. Serve with spaghetti and sprinkle with a final flourish of parmesan. we got ours from Amazon was only £6.99 and you get loads for that. Hi Laura – I found gochujang sauce (not paste) in Sainsbury’s. Do you think this would work with a little less liquid? Thanks. Absolutely yum! The different taste is great. I had to simmer it for 30 mins to get rid of liquid but apart from that all went to plan. Will try ur other Korean recipe soon now I have the sauce. Have just done this Korean Dish and changed it a bit…. Used Turkey Mince as already had in the fridge. Also had Doritos on the side instead of rice/spaghetti. Used vegetable stock instead of beef. Yummy. Second Korean recipe I have done from your kitchen…. Also did the Korean Chicken a couple of weeks ago…. Family loved.